There is a reason why people say you should exercise every day. It boosts your health and makes you feel better about yourself. Plus, it helps you in many other ways that you don’t know about. One of the best forms of exercise is cycling. Even if it is for 20 to 30 minutes a day, cycling will make a huge difference in your life. Some of the health benefits of regular cycling have been listed below. If you want to make a difference in your life, boost your health, and stay fit, try taking up cycling. Trust us, you will not regret the decision. In fact, you might just get addicted. When you cycle, you are improving not only the visible part of your body but also the invisible. The advantages of cycling will impact you from deep inside. Due to the increased physical activity, the food in your digestive system, large intestine to be more exact, will move faster. This, in turn, causes less water to move out of the intestines, which means that your stool will be softer and easier to pass. It will also help reduce the chances of constipation. Another advantage is that as your heart rate and breathing increases, your body will send signals to the intestinal muscles to contract. These contractions will ensure that you don’t get any bloating and keep you safe from bowel cancer. There are a lot of advantages associated with cardio respiratory fitness. It has been researched that as cycling increases the respiratory and cardio rate, this has a positive impact on the brain power. A 5% improvement in mental tests has been detected within people who cycle. New brain cells are formed in the hippocampus thanks to cycling, which can mean that you will have a better memory. Cycling also helps increase blood and oxygen flow to the brain. This leads to a lot of positive impact on the brain cells and will help fight off Alzheimer’s in the future. The best part about cycling is that it keeps you healthy and makes your immunes system function better. This is because it makes the immune cells in your body more active, thus preparing them to fight off any illnesses or infections that may pose a threat to you. Cars, trucks, buses, basically anything that uses gas to run leaves a whole lot of pollution behind. This pollution has been posing a threat to the earth for many years. The least we can do is take steps toward reducing pollution to save the planet for our future generations. One of the best ways of doing that is to switch to a bicycle. Not only do you reduce your carbon footprint, but you will also manage to keep your body healthy. A bonus advantage here is that you will get to your destination faster as you won’t encounter any cycle traffic on the way. Studies have shown that people who cycle manage to reduce the risk of heart diseases by 50%. A person can avoid a heart attack in the future by cycling for at least half an hour every day, mainly because they will be able to keep themselves fitter. If you manage to cycle up to 20 miles in a whole week, you will be able to reduce the risk of heart diseases by 50% as compared to people who do not exercise at all. A lot of people who have weight problems should start cycling as they will be able to lose weight quicker. Cycling is especially good for individuals who are a bit on the bigger side and who do not like to jog or run. its another health benefits of regular cycling. When you cycle, the pressure of your body is exerted on the seat. You avoid putting weight on your feet or bones. This ensures that you do not suffer from any injury and that you lose weight more effectively as cycling involves using most of the muscles in your body. When you cycle, you come back home tired. That’s the best time to grab some sleep. If you manage to sleep at that time, even if it is for a short period, you will notice a considerable difference overall. You will be able to get a deep sleep and better health. The best time to get some sleep is after you come back from a 30-minute bike ride. Studies have shown that cycling has also helped insomnia. Vehicles on the road have doubled in the past few years. In turn, there has been an increase in traffic and traffic jams. Many people have suffered because they were stuck in these jams. If you want to avoid this horrible traffic and get to your destination faster, we recommend cycling. You can find bike lanes that you can take which are the easiest and quickest way of getting to where you want. You will get there in less time than it would have taken you if you went by car. If you have suffered from an injury, many doctors will recommend that you take up cycling. This is because it is an excellent form of exercise that makes your muscles work better. 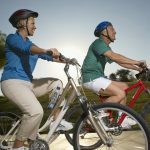 Even for patients suffering from knee pain or osteoarthritis, cycling is recommended as it eliminates the pain. Last but one the least, cycling will leave a massive impact on your mind and that too a positive one. You will feel so much better about your body and yourself that you will witness a boost in your self-esteem. You will have a better perception of your body image and will be able to see yourself differently. Your confidence will increase and so will your stamina. This increase will make you look better in the eyes of other people as well.